By now you all know I love baked goods/food scented products for my body. When I was informed that Trader Joe's had a coconut body butter that was vegan I ran out and bought one. The smell reminds me of vanilla frosting mixed with birthday candles - I know odd right? It is not an overwhelming scent but light and sweet. What makes this body butter amazing is that it absorbs right away and instead of a greasy oily residue your skin is velvety soft! I have been using this on my sensitive hands before bed and it is really nice! I bought another tub of the body butter to give to one lucky winner. All you need to do is tell me when it comes to body products do you have a favorite scent and if so what is it? It also helps if you have a way for me to contact you if you are the winner. The contest is open to everyone and I will pick a winner Sunday October 28th in the afternoon! Good luck! I usually go with patchouli scented things, but I recently I found a green tea-cucumber deodorant that smells divine...I love interesting combos of scents. It depends on the season, but usually coconut lotion in summer, gardenia or jasmine in spring and something vanilla-y in fall/winter. I looooove pumpkin spice scented things year-round though (if I can find them!). I had no idea that lotion was vegan when I saw it at TJ's...do you have a link to where it is verified that it is vegan? Thx!! 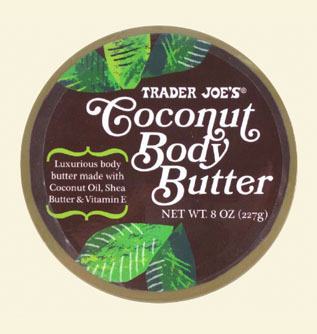 I had no idea Trader Joe's had a coconut body butter! Sounds wonderful! My favorite scent for body products is vanilla. Vanilla and sandalwood are my favorites! Vanilla is my absolute favorite! I like light but spicy smells (chai is a good one) the best, followed by coconut. I went into a Trader Joe's for the first time when I was in New York last week, but the line was wrapped all the way around the store, so I passed. They just opened a Trader Joe's here in Florida about an hour south of me, so I look forward to checking it out.